Children need to receive regular medical care to stay healthy, and that includes regular dental checkups. Considering that most children will start to get their permanent adult teeth at age six or seven, it is your role as the parent or guardian of that child to ensure they are taking proper care of their teeth — even if it is a struggle sometimes. A lot of children have dental anxiety or fear that makes a trip to the dentist’s office seem like a nightmare. 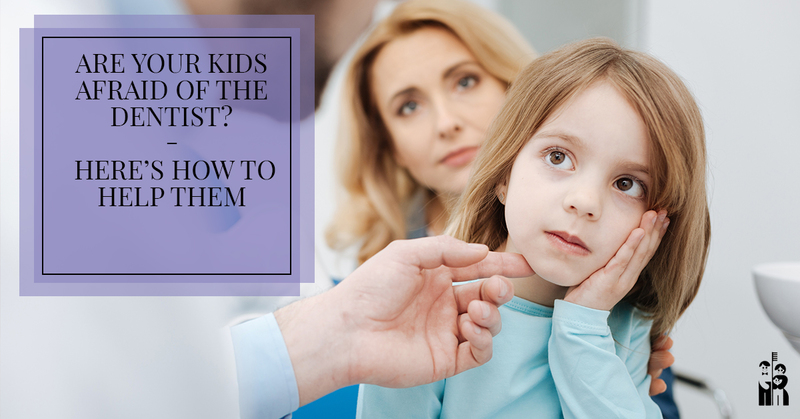 However, there are a few things you can do as a parent to help calm their fears and make regular dental checkups a positive experience! Shores Family Dentistry is the perfect place for both parents and little ones to get their dental treatment. Our family dentists in Fort Collins perform routine pediatric dental care on kids of all ages and our caring staff has experience working with little ones who might not be too excited to see us. Keep reading to learn more about what you can do at home to make the experience here as fun as possible, and be sure to schedule an appointment for your kiddos sooner rather than later. Need To Schedule A Check-Up For You Or Your Kids? Click Here! Don’t surprise them. If you take your little one out to “run errands” and then drag them into an unfamiliar dentist’s office, they are going to be taken aback and frightened, making it all the more likely to experience a meltdown. Let them know as early as possible that they have a dentist appointment coming up so that you have plenty of time to practice the tips below. Remind them how important it is and start oral hygiene routines young. Children don’t need to know about all the bad things that can happen to teeth when they aren’t taken care of, but they should know that oral health is important. As their baby teeth begin to come in, make sure to practice things like brushing and flossing with them. Tell them that brushing helps to keep their teeth strong and that they need strong teeth so they can eat. Let them know that the dentist is just another necessary step to keeping their teeth healthy. Spare them the details. Again, children don’t need to know that dentists occasionally pull teeth, drill cavities, and administer shots of novocaine. Simply let them know they have a dentist appointment coming up, and try to get them psyched about it. Avoid talking about shots or drills or anything that might make them wary. Your family dentist knows how to talk to kids about their teeth, so leave the details to them. Keep it positive. Rather than say we’re going to “check for cavities,” tell your kiddos things like, “The dentist is going to look at your smile” or, “The dentist will make sure your teeth are nice and strong.” Even though your child might have a cavity, we can cross that bridge when we get there. There’s no sense in making them think something might be wrong if nothing is. Play pretend. Before the visit, have a make-believe dental session with your kiddo. First, you can take on the role of the dentist using just a toothbrush. Count your child’s teeth out loud and let them know their teeth look great! You can even have them hold a mirror so they can see what you are doing. Then, switch roles and let them count your teeth or have them practice on a stuffed animal. This will show them that there is nothing to be afraid of when a dentist examines their teeth. Don’t bribe them. Think back to the last time your own parents told you, “If you behave, you’ll get ice cream later.” Likely, your first thought was like, “Woah, why wouldn’t I behave? What’s going on here?” This just puts unnecessary thoughts into your kid’s head. They know that means they are going somewhere not fun, as you would likely not need to promise them a treat if they behaved at the park. If they behave really well at their appointment, praise them afterward rather than promising them something beforehand. Keep your cool. Many of us at the office are parents ourselves, and there is nothing more mortifying than having your own child throw a loud tantrum in public. It is important to keep calm and keep a gentle tone of voice with your little one, as snapping at them or threatening a timeout can only add to their anxiety. We promise we don’t mind if your kiddo throws a tantrum in our office, as long as they are getting the dental treatment they need. Be a good role model. Schedule your own dental check-up a week or two before your child’s. We would not suggest bringing your child along, but afterward, stand in front of the mirror with your little one and say things like, “Wow! Look how shiny my teeth look after going to the dentist! And they are so strong, now!” Your little one will look forward to getting to celebrate their own teeth after the dentist. Don’t give up on dental treatment. We know how stressful it can be if your child wails every time you tell them they have to go to the dentist, but please keep trying. Cavities can pop up quickly in children, and skipping even one regular appointment can cause issues (and give them the idea that it’s okay to not take care of their teeth). Be patient! Children should have their first trip to a pediatric dentist around their first birthday unless their regular doctor suggests they see us earlier. Not only will regular checkups make future visits easier for them, it will also make life a whole lot easier for you and hopefully keep them cavity-free! Get in touch with our family dentistry in Fort Collins today to make an appointment for you and your little one!